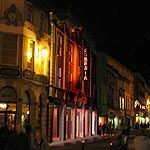 Komedia Club is a superb live performance venue. Here you can see anything from live music to comedy performances and much more. You can also enjoy great food and drinks within the venue. Ticket prices vary please contact venue for further details. What did you think of Komedia Club? Great stand up comedy club! Dynamite Boogaloo is such a fun night at Komedia - the music is fun, the crowd is up for a laugh and the energy is kept up by the perfomers.